It’s difficult to separate Pask’s theories and art however thats what I’m going to do across this and the next post. 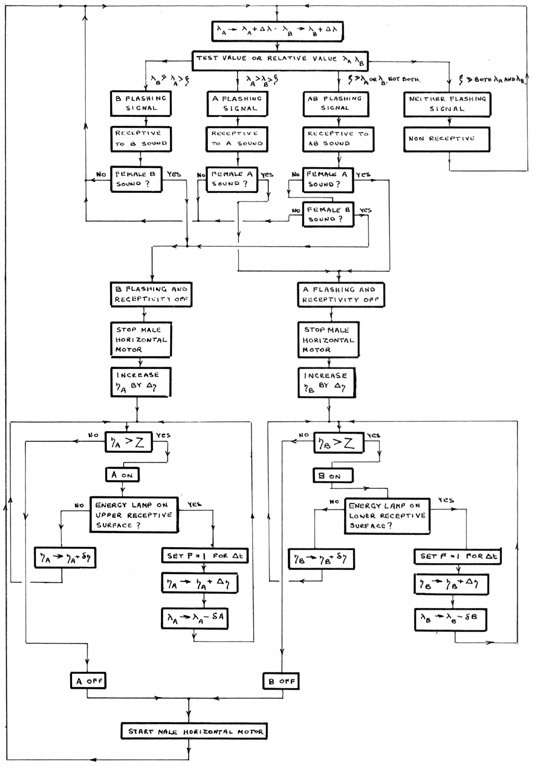 was a reactive, educable, computer-based system composed of five mobiles. By way of light and sound, the rotating elements suspended from the ceiling communicated with each other, independent of external influences. Using flashlights and mirrors, the people at the exhibition could nevertheless take part in the conversation between the machines. With this installation, Pask brought to a conclusion his idea for an “aesthetic potential environment”. 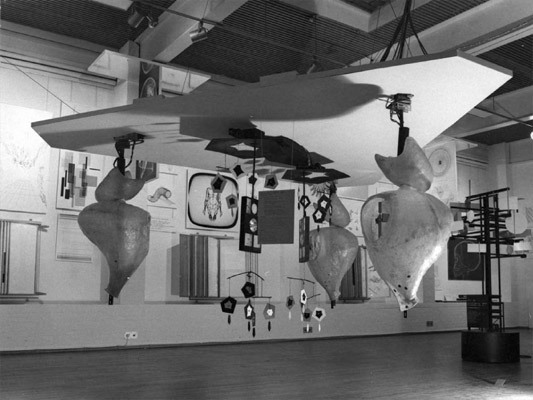 To give significance to the communication between the machines, Park designed the “Colloquy of Mobiles” as a social system. The work alludes to a small ecosystem of creatures, male and female, within their environment. These creatures interact with each other both directly and through their environment yet can also be acted on from outside their environment by us, the user. 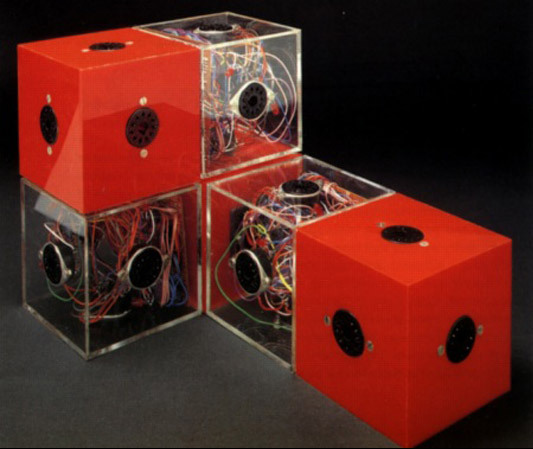 This type of idea, an interactive and networked programmed ecosystem, would later become very popular with new media artists in the 80′s and 90′s such as Christa Sommerer and Laurent Mignonneau, Ken Rinaldo and even very recently Scenocosme. Each cube in turn examines each of its faces, and if another cube is found a message is sent back and control is transferred from cube to adjacent cube until an exhaustive search is completed…This meant that it was possible to build an architectural model with toy bricks and to interrogate it by means of a controlling processor: the result was a virtual model from which complete drawings, perspectives and calculations could be produced. not interested in the argument about whether computers are actually intelligent, alive or conscious, but as a mental exercise it it interesting to consider a building to be conscious at least in the sense of being able to anticipate the implications of its actions, as any good environmental control system should be able to do. The series of exhibitions over the last year on Pask. The re-emerging interest in these initial endeavours recently added to by the announcement on numerous weblogs and mailing lists about the Experiments in Art and Technology (E.A.T) Revisited exhibition, panel, performances and screenings. More information about The Colloquy of Mobiles here, on the Cybernetic Serendipity exhibition here, information on the documentation produced by the Experiments in Art and Technology (E.A.T) here and on the Software exhibition here.